Air New Zealand has dropped the price of their 1-stop flights from Edmonton to Auckland, New Zealand down to $985 CAD roundtrip including taxes. This is about 32% below the typical best prices from Edmonton to New Zealand. These are also the 1-stop flights via Vancouver, the fastest and most desirable flights from Edmonton to New Zealand. For November travel, focus on the Nov 4, 5, 11, 12, 15, 17, 22, and 24 departure dates. Update 9/4 - Air New Zealand has dropped quite a few more of their 1-stop flights from Edmonton to Auckland, New Zealand via Vancouver down to $987 CAD roundtrip including taxes. There are flights available for this price for travel in September 2017 and all the way up to June 2018. Look for the dates that are $1070 CAD roundtrip. Look for the dates that are $987 CAD roundtrip. You may also be able to find flights for $987 CAD roundtrip from Edmonton to Christchurch, Nelson, Queenstown, or Wellington, New Zealand using a similar strategy as above. Update 9/10 - There are now some 1-stop flights from Edmonton to Auckland, New Zealand for $985 CAD roundtrip that are kind of close to peak Christmas and New Year's travel dates (for a longer trip anyways) and for January 2018 travel. 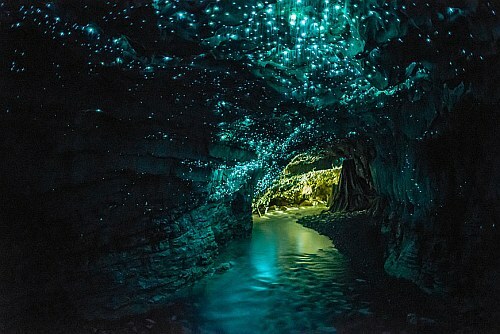 Update 9/22 - Late December to January flights from Edmonton to Auckland, New Zealand have become available again for $975 CAD roundtrip including taxes. Other dates throughout 2017 and 2018 are also available for this price. Try those dates on Flighthub, they will show up as $975 CAD roundtrip. edmonton, yeg, flight deals, australasia, new zealand, auckland, akl, christchurch, chc, wellington, wlg, queenstown, zqn, air new zealand, oceania, nelson and nsn. 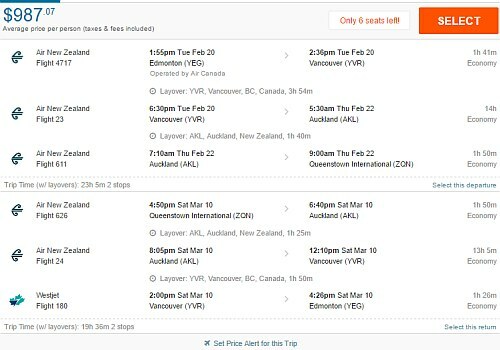 2 Responses to "Edmonton to Auckland, New Zealand - $975 CAD roundtrip including taxes | 1-stop Air New Zealand flights (other cities in NZ also available)"
This flight deal is not working. Most fare are $1200 and up. Even through Air Canada it would cost up to $2300. Katie, if you're just seeing this now, you may want to sign up for the YEG Deals Alerts. That way, you can see the deal right away, instead of 5 days later. The prices can change a lot in a matter of days.